Hello, world! 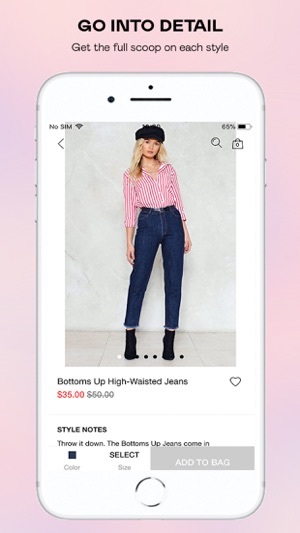 Meet the Nasty Gal app--it’s an app you’ll actually use. Shop for cute stuff, stay in the loop with special offers, and score everything you love on the site at your (literal) fingertips. Shopping just got easier. Refresh, baby! 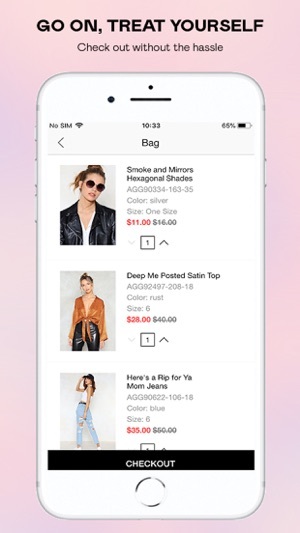 We just got an update so that your shopping is easier than ever. I had such high expectations that I really thought I was going to be leaving a positive review about the clothes after I got them. I can’t even buy the clothes due to a error in the system, according to one of their live chat representatives. The website glitched the first time I tried to place my order, and told me my card was declined. After 3 more cards and checking my account balances, I determined it definitely was not a problem on my end. The worst part about it, is that currently there’s and 80% sale going for the next 5 hours. The live chat representative told me my best bet was to wait 24 hours and try again. Bad service, and bad quality. I was having so much trouble purchasing these items on your website even though I logged in. I did email to complain about it. It took 3 days for me to actively try and get these items. I finally downloaded your app and my cc finally went through! I hope you get your website fixed. I tried to purchase a few more items but because of the delay those items were gone. I love the clothes, but I haven’t been able to see the items on my wishlist for a while now. It’s a bunch of empty pictures with a $0.0 cost. I’ve tried re downloading the app & logging back on a few times, but it doesn’t help. They only way I can see them is when I log into the browser. I was also wondering if you guys would consider re-stocking items! And if you already do, could there be an option where you can add your email to a specific item to get notified when it comes back. © 2018 Nasty Gal LTD.